You can decide exactly what emails you'd like to receive from YogaTrail, and which ones you'd rather not. It's handled in the "email preferences" section of your account management. 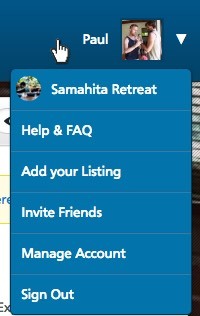 To get to your email preferences, hover your mouse over your thumbnail image in the top right of the blue header. That will reveal a small menu with links to various places. Select 'Manage Account'. From there, click the tab labelled "Emails". 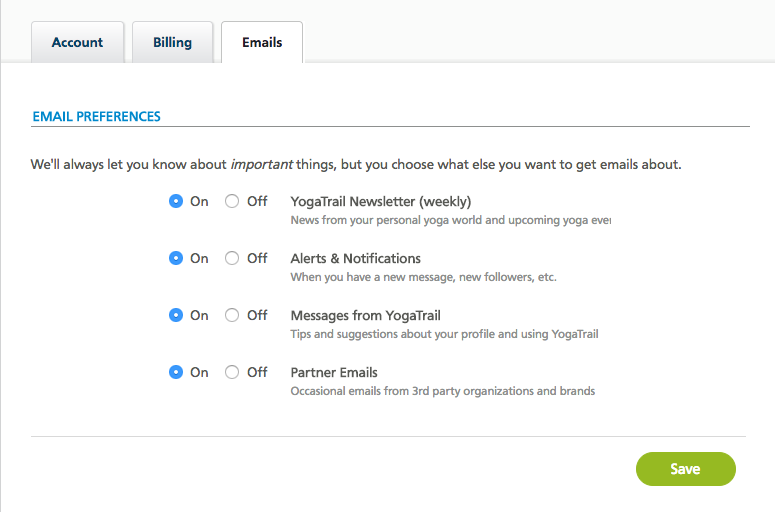 Pro tip: You can also get to your email preferences simply by clicking the "unsubscribe" link found at the bottom of every YogaTrail email. On your email preferences tab, you'll see various options and categories. After making any changes, please remember to click "Save". We recommend that you keep "Alerts & Notifications" set to "On", so as not to miss messages from other people (like your teacher or, if you are a teacher, emails from students or client enquiries).